Jedidiah Noble, who is not a geo-political strategist – he’s actually an engineer – predicted exactly this. If Jedidiah can make these predictions, why is it Mr. Obama can’t? Mr. Obama has done little to stop Putin from rebuilding the Soviet Union. Putin remains in Georgia and has overtaken Crimea with barely-disguised Russian troops slipping in and out of the iron curtain they have erected between Ukraine and Crimea. Yesterday, in a press conference with Ukraine’s PM, Mr. Obama gave Crimea away without even a whimper. Mr. Obama gave away the missile defense shield and got nothing in return. He has drawn red lines and drawn lines without calling them red lines, but has done nothing retaliatory except move the line back. China has been a menace to Japan and is threatening to take over sixteen islands in the East China Sea. The islands have value for their fisheries but mostly it’s a power grab by China and it will give China a strategic advantage in any military conflict. Mr. Obama has done little to nothing to support Japan. When Russia moved into Crimea, Mr. Putin spoke with China’s leaders. He allegedly worked out some sort of deal. One can be sure that China’s imperialistic vision is part of the deal. Russia used the imaginary threat to Russian populations living in Crimea as an excuse to go into Crimea once freedom fighters overturned the government in Ukraine. Now one can expect China to use an imaginary allegiance to Russia as an excuse for taking further steps. In addition to our facing land grabs, we are in trouble economically if Russia and China join forces. We are deeply in debt to both Russia and China to say nothing of the fact that our dollar is threatened as the world currency. The sanctions are only travel bans and asset freezes on people and companies accused by Brussels of violating the territorial integrity of Ukraine. Russia’s Deputy Economy Minister Alexei Likhachev responded by promising “symmetrical” sanctions by Moscow. Mr. Obama is allegedly speaking with Beijing and working on a deal but there is no sign there will be a result favorable to the U.S. Mr. Mingh’s statement is a warning, but then again who could see that coming. Can we even survive two more years of Mr. Obama? Despite pursuing a sustained military crackdown on the opposition in cities across the country, President Bashar al-Assad forged ahead with plans to hold a referendum at the end of the week. Activists in the western city of Hama said troops, police and militias had set up dozens of roadblocks, isolating neighborhoods from each other. “Hama is cut off from the outside world. There is no landlines, no mobile phone network and no internet. House to house arrest take place daily and sometimes repeatedly in the same neighborhoods,” an opposition statement said. Government troops extended their control on Hama after an offensive last week that concentrated on northern neighborhoods on the edge of farmland that have provided shelter for Free Syrian Army rebels. The rebel fighters have been attacking militiamen, known as shabbiha, while avoiding open confrontations with armored forces that had amassed around Hama. Government forces also maintained their siege of pro-opposition neighborhoods of Homs, south of Hama on the Damascus-Aleppo highway. Opposition activists reported sporadic morning shelling of Baba Amro district. Security forces also mounted a campaign of arrests and raids in two suburbs of Deraa city and loud gunfire was heard, activists said. The reports could not be independently verified. The Monday actions followed a weekend which saw one of the biggest demonstrations yet in the capital as the pro-democracy uprising against Assad’s 11 year-rule neared its first anniversary. The conflict has also pitted Western and Gulf-led Arab powers against Assad allies Russia, China and Iran. The former have condemned Assad for the bloodshed and called for him to step down. Beijing and Moscow say all sides are to blame for the violence and the crisis should be resolved through talks, not foreign intervention. A Chinese envoy met Assad in Damascus on Saturday and backed his plan to hold a referendum this coming Sunday on a new constitution which would lead to multi-party parliamentary elections within 90 days. Syria’s official SANA news agency said about 14,600,000 people throughout the country were eligible to take part in the referendum. The West and Syrian opposition figures have dismissed the plan as joke, saying it is impossible to have a valid election amid the continuing repression. Assad has ruled Syria for 11 years after succeeding his father Hafez on his death. The Assad family belongs to the Alawite sect, an offshoot of Shi’ite Islam, in a majority Sunni country, and there are fears the uprising could break down into a full sectarian conflict. 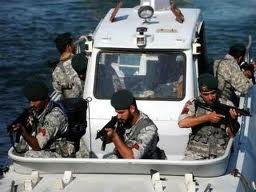 Meanwhile two Iranian naval ships docked at the Syrian port of Tartous on Saturday, Iran’s state-run Press TV reported. The ships were said to be providing training for Syrian naval forces under an agreement signed a year ago. likely to add to Western concerns that the Syria crisis could boil over into a regional conflict if it not resolved soon. Foreign ministers at a G20 industrialized and emerging nations meeting in Mexico were increasingly worried about whether a peaceful solution could be found. Australia’s foreign minister, Kevin Rudd, told reporters in Los Cabos, Mexico. The West has ruled out any Libya-style military intervention but the Arab League, led by Saudi Arabia, has indicated some of its member states were prepared to arm the opposition. In Washington the senior U.S. military officer, General Martin Dempsey, said intervening in Syria would be “very difficult” because it was not like Libya. Syria’s army is very capable, with a sophisticated, integrated air defense system and chemical and biological weapons, Dempsey said. It was also not clear who or what the fragmented opposition was exactly, he said. A so-called “Friends of Syria” conference is scheduled to take place in Tunisia this Friday, bringing together Western and Arab powers. Feb. 14 (Bloomberg) — Iran might respond to sanctions with “low-level provocation” such as slowing shipping through the Strait of Hormuz, keeping oil prices at their currently high level, according to three Standard & Poor’s reports. Iranian authorities could disrupt supplies of oil from the Persian Gulf by imposing tanker inspections or boarding merchant ships in its territorial waters, supporting oil prices because markets would increasingly view armed conflict as “a real, if remote, possibility,” according to the reports’ authors, who include Paris-based Jean-Michel Six, S&P’s chief economist for Europe. The likelihood of severe disruption of oil supplies through the strait, through which 20 percent of the world’s oil flows, is “very low,” though if one did occur, it might boost oil to $150 a barrel and push economies into a recession, according to the reports. The U.S. and the European Union are imposing tougher sanctions on Iran and Israel has talked of an attack on the Islamic Republic’s nuclear facilities in an attempt to halt its atomic program. Iran, which says its nuclear program is for civilian purposes, has threatened to block the Strait of Hormuz in retaliation. The three S&P reports discuss the impact of rising Gulf tensions on Middle Eastern states seeking to borrow money, the risks that a closure of Hormuz would pose for companies looking for credit and the threats to global economic growth from an oil shock. Feb. 13 (Bloomberg) — Sanctions on Iran are tightening after Overseas Shipholding Group Inc., Frontline Ltd. and owners controlling more than 100 supertankers said they would stop loading cargoes from the Organization of Petroleum Exporting Countries‘ second-largest producer. 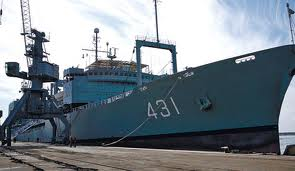 OSG, based in New York, said Feb. 10 that the pool of 45 supertankers from seven owners in which its carriers trade will no longer go to Iran. Four OSG-owned ships, managed by Tankers International LLC, called at the country’s biggest crude-export terminal in the past year, ship-tracking data compiled by Bloomberg show. Nova Tankers A/S and Frontline, with a combined 93 vessels, said Feb. 9 and 11 they wouldn’t ship Iranian crude. Previous efforts to curb Iran’s oil income and stop it from developing nuclear weapons failed because the structure of the shipping industry means vessels are often managed by companies outside the U.S. or European Union. 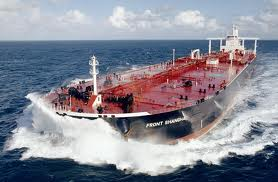 An EU embargo on Iranian oil agreed to Jan. 23 extended the ban to ship insurance. With about 95 percent of the tanker fleet insured under rules governed by European law, there are fewer vessels able to load in Iran. OSG’s Overseas Rosalyn, which can carry about 2 million barrels, arrived at Kharg Island on Jan. 27 and departed the next day, tracking data compiled by Bloomberg show. It left about 16 feet deeper in the water, an indication it loaded cargo. The vessel is managed by Tankers International, which has its head office in Cyprus. OSG complies with all U.S. and European laws and its headquarters in New York doesn’t manage charters, OSG Chief Executive Officer Morten Arntzen said in an e-mail Jan. 30. Tankers International told owners the pool’s vessels will no longer sail to Iran after changes to EU regulations, Arntzen said in a Feb. 10 e-mail. Insurers are no longer able to cover vessels trading in the Persian Gulf nation, he wrote. Ship owners sometimes group their vessels to coordinate charters and improve earnings. The Tankers International pool operates 45 very large crude carriers, or VLCCs, from OSG and six other companies, including Antwerp-based Euronav NV and St. Helier, Channel Islands-based DHT Holdings Inc.
Frontline companies including Hamilton, Bermuda-based Frontline Ltd. and Frontline 2012 won’t ship Iranian crude, Jens Martin Jensen, chief executive officer of Frontline Management AS, said by e-mail and phone on Feb. 11 and 12. Frontline operates 43 VLCCs, according to its website. Nova Tankers, the Copenhagen-based operator of a pool of ships including vessels owned by Mitsui O.S.K. Lines Ltd., won’t load Iranian crude because of European sanctions, Managing Director Morten Pilnov said by phone from Singapore on Feb. 9. The pool will have about 50 vessels by the end of this year, according to data on its website. Nippon Yusen K.K., the second-largest owner of VLCCs, won’t carry Iranian oil if it means ships aren’t insured, Yuji Isoda, an investor relations manager for the Tokyo-based company, said Feb. 9. The company doesn’t yet know how its insurers will handle the EU sanctions, he said by phone. U.S. and EU leaders are trying to tighten restrictions on business with Iran, which produced 3.55 million barrels of crude a day in January, 11 percent of OPEC’s total, according to data compiled by Bloomberg. Oil sales earned Iran $73 billion in 2010, accounting for about 50 percent of government revenue and 80 percent of exports, the U.S. Energy Department estimates. The United Nations has imposed four sets of sanctions on Iran, and the International Atomic Energy Agency said in November the country had studied making an atomic bomb. The government in Tehran says its nuclear program is for civilian purposes and that documents held by the IAEA purporting to show designs and tests of weapon components are fakes. Iran has threatened to block shipments through the Strait of Hormuz in the Persian Gulf, through which about 20 percent of the world’s globally traded oil passes. Crude futures in New York advanced 32 percent to $100.19 a barrel since Oct. 4. More trade with Iran may be blocked if a bill approved Feb. 2 by the U.S. Senate Banking Committee becomes law, making U.S. companies responsible for the actions of their foreign units when dealing with Iran. A spokesman for committee chairman Tim Johnson, a South Dakota Democrat, declined to comment. While the Japanese government said last month it would curb imports from Iran, India’s Foreign Secretary Ranjan Mathai said Jan. 17 his country wouldn’t. China, the Persian Gulf country’s largest customer, needs the oil for development, Vice Foreign Minister Zhai Jun told reporters Jan. 11. Founded in 1948, OSG has 111 vessels and 3,500 employees, according to its website. Its biggest shareholders include the family of board members Oudi and Ariel Recanati, who control about 10 percent, data compiled by Bloomberg show. Oudi Recanati is an Israeli citizen and Ariel Recanati is a U.S. citizen, according to a Sept. 6 filing with the Securities and Exchange Commission. Charles A. Fribourg sits on the board of OSG and Continental Grain Co., the data show. Shares of OSG, which has 14 supertankers, fell 71 percent in the past year as a glut of vessels drove down transport rates. The company will report a loss of $178.6 million for this year, down from $204.4 million for 2011, according to the median of five analyst estimates compiled by Bloomberg. Three other OSG vessels from the Tankers International pool called at Kharg Island in the past year, data compiled by Bloomberg show. They fly the Marshall Islands flag, which means they are registered there for regulatory purposes, according to data on the website of International Registries Inc. Almost 9 percent of the tanker fleet is flagged in the Marshall Islands, behind Panama and Liberia, according to data compiled by London- based Clarkson Plc, the world’s biggest shipbroker. –With assistance from Michelle Wiese Bockmann and Rob Sheridan in London. Editors: Dan Weeks, Sharon Lindores. Sanctions imposed against Iran will not affect the IP gas pipeline project and therefore Pakistan will continue to pursue it, Pakistan’s Minister for Petroleum and Natural Resources Asim Hussain said. According to a statement issued by Pakistan’s Ministry for Petroleum and Natural Resources, Pakistan needs to meet its energy demands immediately and for this, all options are to be availed. 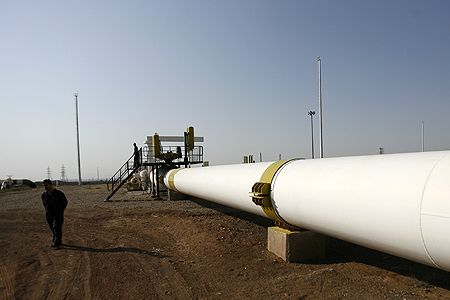 Based on agreement between the two countries, Iran agreed to export 21.5 million cubic meters of natural gas daily, 7.8 billion cubic meters annually.